The findings of the 23rd Oil & Gas Survey – launched today – should come with a government warning: its contents suggest a danger of serious damage to our economic health. 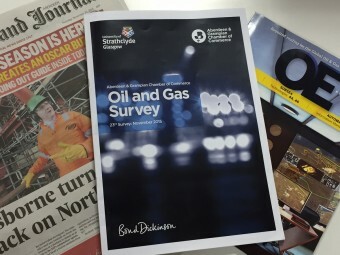 For those connected to the industry, the Aberdeen and Grampian Chamber of Commerce document makes grim reading. Throw in the perceived lack of support from Chancellor George Osborne in yesterday’s Autumn Statement and the UK Government’s axing of the £1bn grant for the development of new carbon capture and storage (CCS) technology, and it’s a pretty bleak picture. Perhaps, however, it’s merely further confirmation of the state we are in; of the economic reality for businesses in the north-east of Scotland. The report does highlight the opportunities in the decommissioning sector whereby skills gained on North Sea projects could be exported in time to other oil producing regions. And, as in previous downturns, there will be opportunities to capitalise on new thinking, collaboration and the formulation of smart solutions. All in all, there was a general acceptance among those at the launch gathering that the survey confirmed where we are, as opposed to throwing up any surprises. But let’s be positive wherever we can. Amid all the doom and gloom at the breakfast launch, the bacon rolls were excellent.